You will be remembered for many years to come when this stainless steel oil/vinegar dispenser is used. 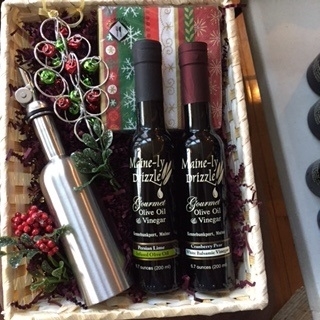 The basket also includes jingle bells ornament, holiday napkins and 6.7 oz Persian Lime Olive Oil and 6.7 oz Cranberry Pear White Balsamic Vinegar. If you would like to replace the oil and vinegar with another selection, let me know via comments when placing your order.